Qualité maison de 3 chambres 2 salles de bain avec un loft que les enfants adorent! Beaucoup d'espace de couchage dans le grenier. Grande salle de lavage avec 2 séchoirs pour les vêtements humides! Jouets de neige, avant sur luge. Grandes terrasses, barbecue à gaz, même en hiver! Dish TV, bon service à la cellule. Allée en béton avec beaucoup de stationnement. Une grande lumière avec de belles fenêtres et une grande sensation. Combler au balcon supérieur à travers le salon. Unique! Jeux, DVD, musique et bien plus! Pacific Trail tête près. Rainbow Lodge à proximité. Plein d'activités et juste à côté de la rivière Yuba. Poisson ou soleil à la plage de propriétaires. Over the years, this area has had a number of new houses built, traffic has become heavier. The environment now feels residential rather than serene. But the house itself is lovely, with modern amenity. We rented this house and loved it.. Everything was wonderful from the furniture to the artwork, the kitchen is stocked very well. The owner contacted us during our stay to make sure everything was ok, which I think was very nice. You really feel as if your in a friends home and not a rental home. We will be repeat renters for sure! Thank you for staying with us and for your great review! I'm really pleased you enjoyed yourself! You are absolutely welcome to stay with us anytime! Our family stayed here for Christmas and had a great time! The location is great and there are plenty of things to do. 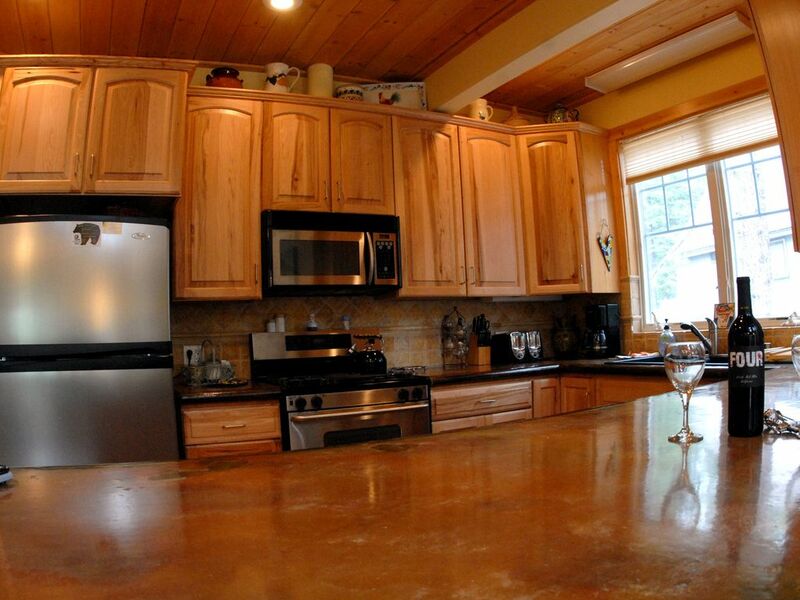 The house is very comfortable and spacious with a wonderful kitchen. The owners also take care to make sure everything you need is there for you to use. We would certainly stay here again and recommend it to anyone! Thank you for the kind words and taking time to give us your review! It's always great to hear positive feedback! We would love to accommodate you in the future! My wife and I came for our anniversary from just an hour from our house. When we walked in we saw the attention to detail very clean and modern with the classic cabin feel. We listened to music, a nice fire in the wood stove with wine while we cooked. Very relaxing to say the least. We are planning our next stay here to bring our 2 kids already, the kids would have a great time in the loft. We highly recommend. Thank you for the great review! We take great pride in privoviding a fully stocked, comfortable house that is suitable for couples or families. Kids always enjoy the loft where they get the birds eye view on happenings in the house! Please bring them back for a nice weekend anytime. We would love to have you! Thank you for the kind words! I'm glad you had a great experience! And thank you for taking such great care of our house. It sure helps us keep it in top condition for our guests. You are definitely welcome anytime! We stayed in this cabin for a wedding weekend at Cisco Grove. It was spacious and comprtable and perfect for my elderly parents because it had a first floor master and only a few steps to get into the cabin. Plenty of room upstairs to sleep and hang out. We did not have to use the sleeping loft but it would be really nice if you have multiple families with lots of kids. Everything you would every want or need is in this cabin. We really loved our stay! Thank you the kind review! I'm glad you had a great time! I hope we can host you in the future. Situé à quelques minutes des stations de ski et des sentiers. Grande année. 12-15 minutes à Truckee. Escalade, Donner Lake, sentier de la côte du Pacifique, Lola Montez tous à proximité. 3 night minimum stay over Holidays, Fri, Sat,Sun. No Pets please!! !